All Sandwiches are Served on a Organic 9-Grain Wheat Bread and are Served with Sun Chips, Fresh Fruit Salad, and a Home-Baked Cookie. Condiments are Served on the Side. All Sandwiches are Served on an Organic, Home-Baked Artisan Roll and are Served with Sun Chips, Fresh Fruit Salad, and a Home-Baked Cookie. Condiments are Served on the Side. Chef Salad with Smoked Ham, Turkey, Provolone Cheese, White Cheddar Cheese, Tomatoes, Avocado, Cucumber Slices & a Hard-Boiled Egg, Served with Ranch Dressing. Caesar Salad Tossed with Grated Parmesan Cheese, Pepperoni Chips, and Croutons, Served with Traditional Caesar Dressing. Orchard Chicken Salad with Organic Grilled Chicken, Sun-dried Apricots, Apple Slices, Feta Cheese and Sliced Almonds, Served with Strawberry Vinaigrette. Grilled Vegetable Salad with Zucchini Squash, Red Onions, Red Bell Peppers, Asparagus, Mushrooms, and Feta Cheese, Served with Fresh Herb Vinaigrette. All Salads Include Focaccia Bread and a Home-Baked Cookie. 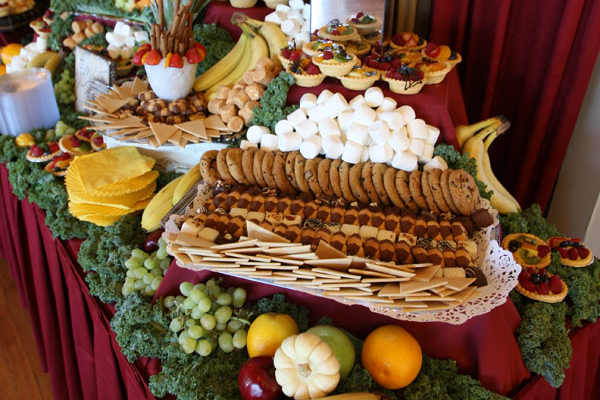 Our Event Specialists Can Suggest Additional Delightful Menu Options to Help Make Your Occasion a Memorable Success. Prices Subject to Change Without Notice. Please Note: An Applicable Business Operations Charge, Sales Tax and Delivery Charge are Added to All Orders. Prices Are Based on a 25 Guest Minimum.